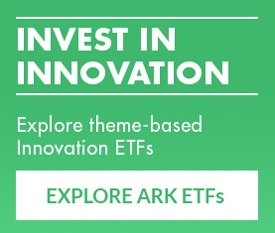 To find promising investment opportunities in the consumer internet, we believe it is imperative to look for companies that improve convenience in industries that haven’t changed in decades. Convenience explains the success of Amazon, Expedia, Netflix, and Uber. Each of these companies attacked an industry that burdened the consumer with work—whether searching through bookstores or finding taxis—and made it as simple as tapping a screen. The latest industry to be attacked by internet-enabled convenience is meal delivery. Companies such as GrubHub, Uber Eats, Meituan, Just Eat, and Deliveroo are eliminating the friction associated with cooking and dining out. 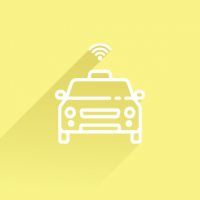 Just as on-demand car hailing is upending the notion of car ownership, meal delivery could change attitudes toward shopping, cooking, and eating. Given the size of the grocery and restaurant markets, the winner in this space could become the next Amazon. Even before the internet, technology was an important change agent in the food industry. Thanks to industrialized agriculture, the percentage of the US workforce employed in food production has dropped from more than 90% in the 18th century to less than 10% today. On the consumption side, the percentage of food that is self-produced has dropped from roughly 33% 150 years ago to less than 1% today, as shown below. As agriculture has industrialized, the scale and efficiency of food production has improved dramatically, eliminating the chore of individual farming that had been a fact of life for thousands of years. Just as they did not want to be farmers then, most people do not want to cook today: roughly 90% of Americans either hate or feel ambivalent toward cooking, according to a study by HBR. As a result, the modern restaurant industry has grown to a revenue base of $830 billion in 2018, as shown below. Americans today spend more money on “dining out” than buying groceries. Even without much help from technology, at least not yet, convenience has triumphed over cost, creating a larger market in the process. While dining out eliminates the chores of cooking and cleanup, it also comes with its own set of inconveniences. Getting to a restaurant takes time and effort while interacting with servers in a social setting can be tiresome and uncomfortable. Meal delivery offers the best of both worlds: cooked food delivered to customers who can enjoy it in the comfort and privacy of their homes. Prior to the internet, meal delivery meant pizza and Chinese food. The mobile internet has given rise to meal ordering apps such as GrubHub that act as a platform for any restaurant. In urban areas, these platforms offer the services of myriad vendors ranging from Italian to Thai, and from burgers to tacos. Like Expedia and AirBnB, meal delivery platforms are aggregation business models: by commoditizing supply, in this case restaurants, they can collect fees on all orders without owning physical assets. Moreover, they enjoy strong network effects given the three-sided marketplace of restaurants, customers, and delivery drivers. Each group reinforces the other, leading to “winner-take-most” market dynamics. For meal delivery to replace a large percentage of home cooked meals, it needs a nutritional profile that’s closer to home cooking than fast food. The restaurant industry has been evolving in this direction, with each generation of casual food chains featuring more sound nutrition. Chipotle Mexican Grill, one of the most successful chains in recent decades, owes much of its success to fresh ingredients, meat raised humanely, and on-premise cooking. Sweetgreen has 90 locations in the US and recently hit $1 billion in valuation on the strength of its freshly made, custom salad bowls. Wide selections, healthy options, and mobile ordering have turned meal delivery from a niche market to something much bigger. 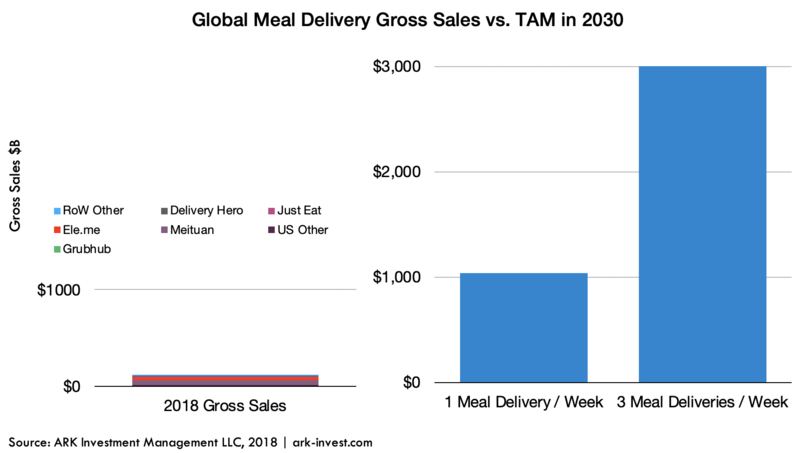 At first blush, the total addressable market (TAM) for food delivery seems likely to approximate that of the restaurant industry. Ten percent cannibalization of the $800 billion US restaurant industry, for example, would suggest a domestic revenue opportunity of $80 billion. 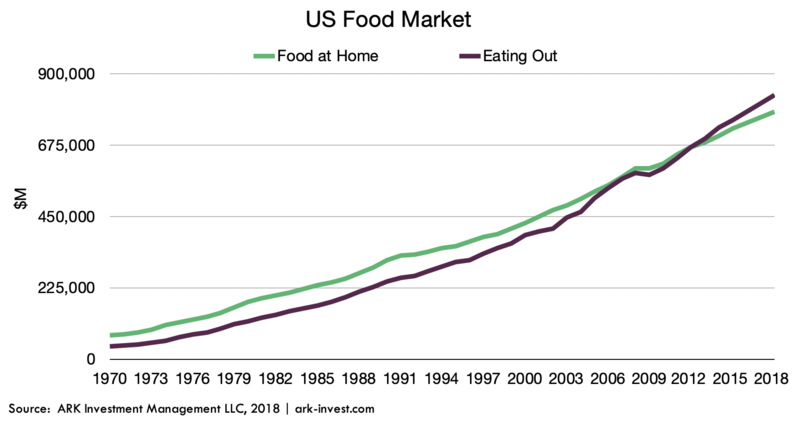 True, but this estimate fails to incorporate an important nuance: meal delivery takes share not only from eating out but also from home cooked meals, creating a new market. For most meals, consumers do not want to cook or go out to a restaurant, pointing to quite a large market opportunity. 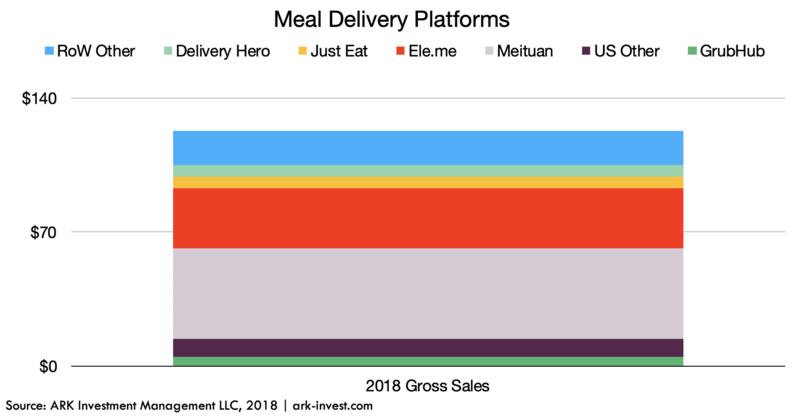 Despite the relatively new model, online meal delivery platforms already have hit $120 billion in gross food sales globally, as shown below. Unlike the case with past internet enabled business models, China—not the US—is the market leader by far in meal delivery. Meituan and Ele.me generate close to $80 billion in gross sales annually, accounting for 64% of global market share. GrubHub, the market leader in the US, contributes just $5 billion in comparison. 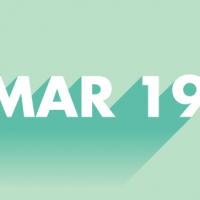 While most meal delivery companies are growing at a rate north of 40% annually based on the latest financial filings, how sustainable is this growth? Is it a bubble fueled by venture funding? While some froth exists in the private markets, most meal delivery companies are public and operate at slim margins. Last year, Meituan reported 14% gross margins, up from 8% in 2017. One of the more mature companies in the group, GrubHub, has delivered operating margins of roughly 15% since its initial public offering (IPO) in 2014. Overall, while marketing spend does seem to be fueling the industry’s high rate of growth, underlying unit economics appear sound. In our view, while meal delivery has universal appeal, its primary constraints are disposable income and delivery infrastructure. The Brooking Institute estimates that half of the world’s population is middle class or higher. The UN estimates world population will reach 8.6 billion by 2030 and that more than half already live in urban areas. Based on these inputs, conservatively, a third of the world population—about 2.8 billion people—should be able to afford and access meal delivery services in 2030, up more than 50% from the 1.8 billion that can do so today. If 2.8 billion consumers in 2030 were to access meal delivery services once a week at an average cost of $7 per meal, the market would scale nearly 10-fold to roughly $1 trillion at an annual rate, as shown above. If adoption were to hit 3 meals per week, the market size could reach $3 trillion. Interestingly, Meituan users already order through the service more than three times a week, suggesting that our estimates could be much too conservative. In other words, at an implied penetration of just 4% today, the $120 billion global meal delivery market1 is nascent relative to its long-term opportunity. Subscriptions — as consumers become accustomed to ordering meals from a single platform, subscriptions could become the natural business model. Already, more than 20 meal kit subscription companies have evolved, a model that cooked meal platforms could emulate. Dark Kitchens — Platform companies like Uber Eats have direct insight into consumption patterns and are commissioning “dark kitchens”—non-restaurant kitchen spaces—to fulfill demand for certain items during peak hours. Over time and regulations permitting, food production could become centralized and data driven, potentially driving efficiency up and costs down. Kitchen Automation – A new class of robots equipped with sensors, called collaborative robots or cobots, can work safely alongside humans. Currently on trial in a number of restaurants, cobots could help restaurants scale without adding much labor which, at one third of restaurant expenses in today’s model, could make the economics quite attractive. Autonomous Delivery – A major drawback of current delivery platforms is the need for human couriers, adding $3-4 per delivery. According to our research, regulations permitting, hot food could be delivered by autonomous vehicles or drones at one tenth of that cost or less. The net effect of these four trends should increase customer retention with subscriptions, expand the total addressable market with a wide range of restaurant selection, and improve restaurant and platform margins through automation and autonomous vehicles. Amazon, Expedia, AirBnB, and Uber have shown that companies able to aggregate supply while offering improved selection and convenience are highly disruptive to legacy business models. By eliminating the chore of shopping, cooking, and cleaning, online meal delivery platforms have the potential to disrupt the global food industry. Food retailers probably will see declining sales while the food service sector expands. Meal ordering platforms stand to benefit the most, perhaps capturing up to $3 trillion in annual gross food sales by 2030.